Butler football players Nick Coyle, left, and Bryant Johnson signed National Letters of Intent to play football on Wednesday, February 6. Coyle will play at Georgetown (KY) University and Johnson at the University of Cincinnati. 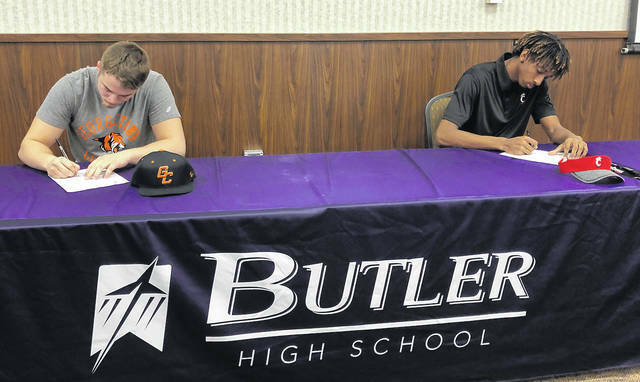 VANDALIA — Two Butler football players will continue their playing careers in college after making commitments on national signing day on Wednesday. Nick Coyle, who led the Aviators in tackles last season, signed to play for the Georgetown (KY) University Tigers while Butler’s leading pass receiver, Bryant Johnson, committed to the Bearcats of the University of Cincinnati. “I really like the coaching staff and the weight room game plan there and I had a really good feel for the place on my visit,” said Coyle who credited coach John Puckett and his staff for his “falling in love with football all over again” during his senior season. Johnson said that the campus and coaching staff were key to his decision to sign with the Bearcats. “BJ is a kid who is just now coming into his own,” said Puckett. “To have a kid with his height who has the footwork he has along with his flexibility and ability to change direction, he’s a phenomenal athlete. I can’t imagine what his season would have been like if he’d been healthy all year. https://www.vandaliadrummernews.com/wp-content/uploads/sites/19/2019/02/web1_SigningDay.jpegButler football players Nick Coyle, left, and Bryant Johnson signed National Letters of Intent to play football on Wednesday, February 6. Coyle will play at Georgetown (KY) University and Johnson at the University of Cincinnati.